Compare this with the iPad 2 specs: dual core 1GHz, 512MB RAM, 10″ touch screen, 1.2lbs, for $499… what a difference two decades makes huh? If you want this setup yourself, availability of iPad 2 is very strained and most stores are sold out, but I did see a Macintosh Portable on eBay for a reasonable $75! 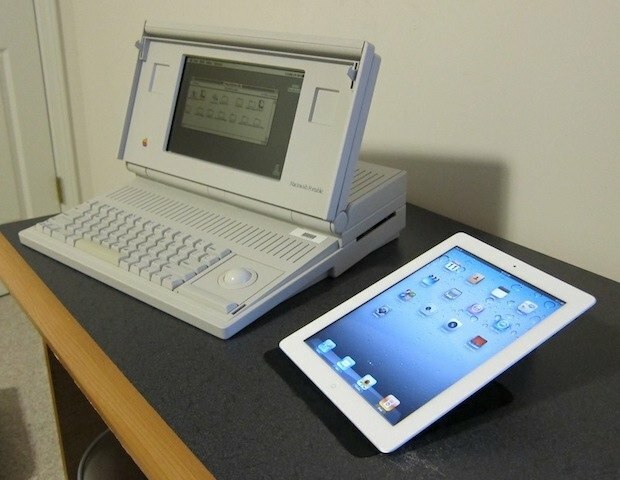 I enjoy retro Apple stuff and I love the iPad, so this picture is right up my ally. The white iPad 2 looks great doesn’t it? These pictures come to us via MacRumors forums, thanks for sending this in Jeff! And that’s just specs. How many developers and applications existed for the portable versus the ipad? Sure you could probably develop for the portable, so you’d shell out weeks of time to build your application or within a minute or two you can spend a few dollars and download the software you want. Also you’re missing one important spec from the comparison, the ipad2 can be used to communicate from nearly anywhere on the planet to anywhere (with the 3G radio and service) Did a modem exist for the portable? 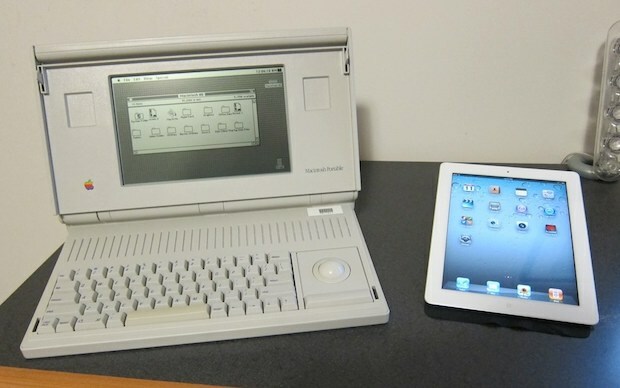 The post does not say that the Macintosh Portable is better than the iPad, it is just a reflection on the evolution of portable computing. Walk blindly into traffic. Really.